Twilight awareness – the gift of time. Skyclock is twilight, sunrise, and sunset times on an analog face for your exact location. Skyclock, for both the iPhone and the PC (Windows only), has a 24 hour mode that makes a lot more sense to me than the 12 hour ‘conventional’ mode. Find the iPhone on the iTunes App Store (it’s free, ad-supported) and go to Skyclock for the PC version. I feel it’s similar to the more minimal Sol for the iPhone, but sadly that seems to have disappeared from the App store. Just a quick note to let you know the latest version contains an upgrade option to eliminate the ads. 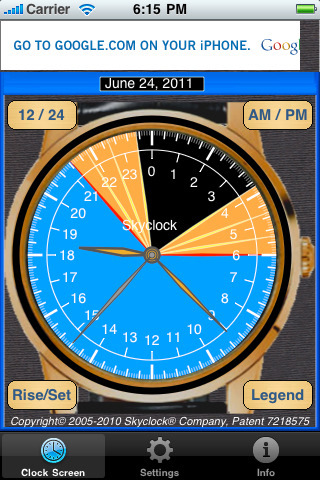 Skyclock is also available for download to the iPod Touch. These were the two most requested improvements. In the latest version of Skyclock’s iPhone app we’ve added an icon to the analog display for the sun’s zenith time for your specific location. In the info text, you can also see the sun’s elevation (in degrees) at zenith.